Why is God’s name is this dog biting a wrapped up mummy? Well, only the artist knows. But it sure is a funny sight. 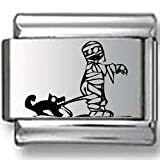 If you’re into wacky humor, and…umm…mummies, this would be a nice charm for you! The Dachshund’s elongated body predisposes them to back issues. Another genetic component is the discs outer layer being thinner than normal and sometimes calcifying making it brittle. Discs are the cushions between the vertebrae in the spinal column. The medical name for this health issue is Intervertebral Disc Disease. It is possible for the herniation to occur in the neck area, but more frequent in the middle of the back where the chest and abdomen meet (where most stress is absorbed when jumping). The exact cause of a disc bulging or rupturing is frequently unknown. It is rarely associated with a severe trauma, many believe it occurs by dogs jumping off furniture. While preventing your dog from jumping off furniture is difficult, every effort should be made to train them to wait to be picked up or to use a ramp. There is a wide array of ramps or steps available to assist the dog going up and down to beds, couches and other furniture. Traversing long stairs should also be avoided as well as play that involves twisting and jumping. When you carry your Dachshund keep his spine horizontal and use two hands to pick him up with one hand supporting his waist or rear legs. 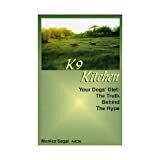 Keeping your Dachshund’s weight down will also mitigate back issues, extra weight is a constant strain. Treatment almost always includes using an anti-inflammatory medicine. You’ll hear the term “conservative treatment”, this means a less radical approach or non surgical. Conservative treatments can include rest and medication, injections (Adequan is a medication said to promote healing of disc cartilage) and even chiropractic or acupuncture treatments. While surgery is expensive it can be highly effective if done within the first twenty-four hours of paralysis. After twenty-four hours the success rate drops, but with therapy and rest there is still hope. Paralysis in Dachshunds is not a death sentence. Surgery and conservative treatments will often bring your dog back to 100 percent. There has also been some success with therapy in paraplegic Dachshunds. Gentle manipulation of the paralyzed limbs and water walking (where the water supports his rear end) and towel walking (a towel slung under his abdomen for support) have been cited in success stories. Some paraplegic dogs are fitted for carts and back to racing through the house in no time. 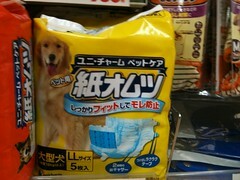 Dog diapers are available for bowel and bladder issues, I’ve even seen them in hot pink with lime green polka dots. There is no universally correct treatment for all Dachshunds with back trouble. This is a choice that you and your vet need to make after evaluation of his symptoms, your dog’s overall health and age, and the length of time since injury. Unfortunately, like in human medical issues, your finances will also play a role. If you feel it is time to see a specialist look for one specializing in neurology and surgery with experience with Dachshunds. www.directorydogs.com DirectoryDogs.com provides a directory of dogs, dog breeder, dog products, dog supplies, dog service, dog food, dog toys, grooming, apparel, dog training, dog information & resources.